Passo di Gavia (23.3rd km, 2618 m) The epic Passo di Gavia climb is starting at 6.1st kilometer at Ponte su T. Frigidolfo (1298 m). Riders will gain 1320 meters in 16.5 kilometers (average 8%, max. 16%). The average gradient is 5.3 in first part (2 km), then 8.8% in second part (2 km – 7.750 km – the max. gradient of 16% is in this part). 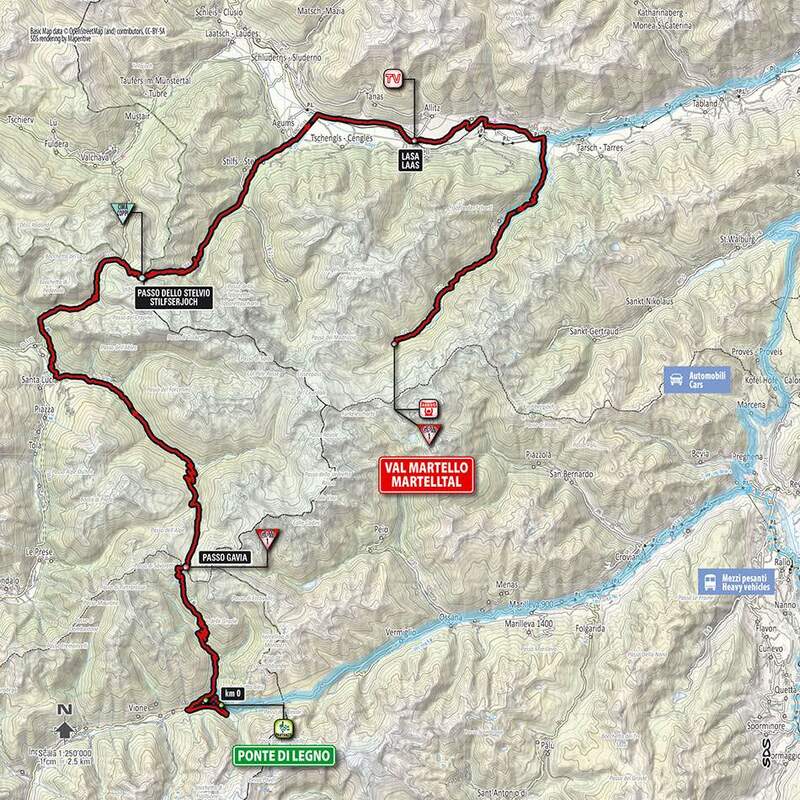 3rd part between 7.750 – 13.350 km has average gradient of 7.9%, and the last part has average gradient of 8.8%. Paso dello Stelvio (70.3rd km, 2758 m) – Cima Coppi The Cima Coppi is the highest altitude reached by cyclists during the Giro d’Italia. It was established in 1965, five years after the death of the “campionissimo” (champion of champions) Fausto Coppi. 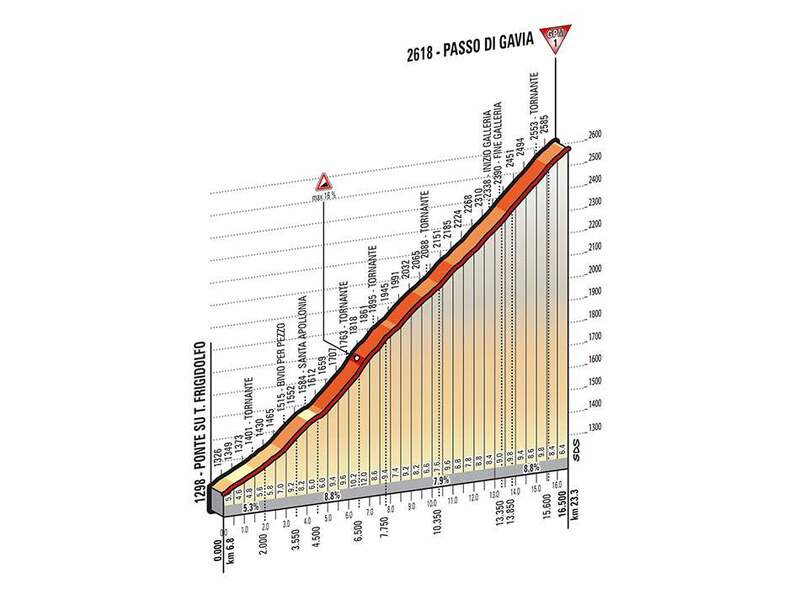 2014 Giro’ Cima Coppi, the epic climb of Passo dello Stelvio is starting at 48.1st kilometer at Bormio (1205 m). 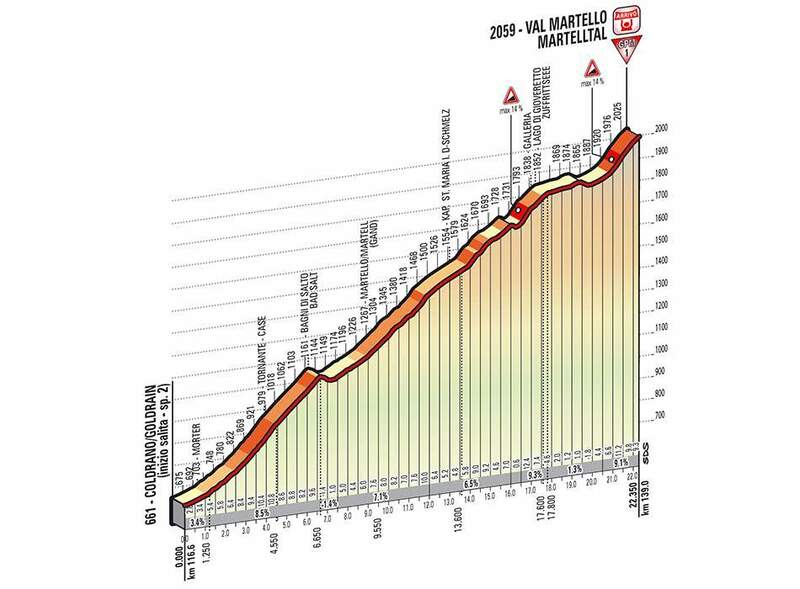 Riders will gain 1553 meters in 21.7 kilometers (average 7.2%, max. 12%). 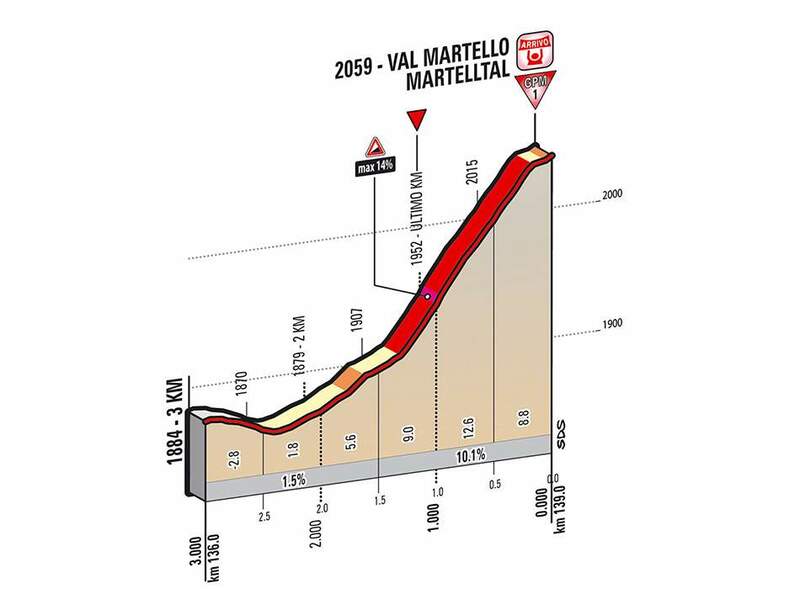 Val Martello/Martelltal (139th km, 2051 m), Summit finish Starting at 113.9th kilometer at Coldrano (661 m). 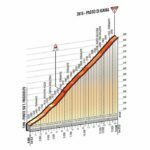 Riders will gain 1422 meters in 22.3 kilometers (average 6.4%, max. 14%). 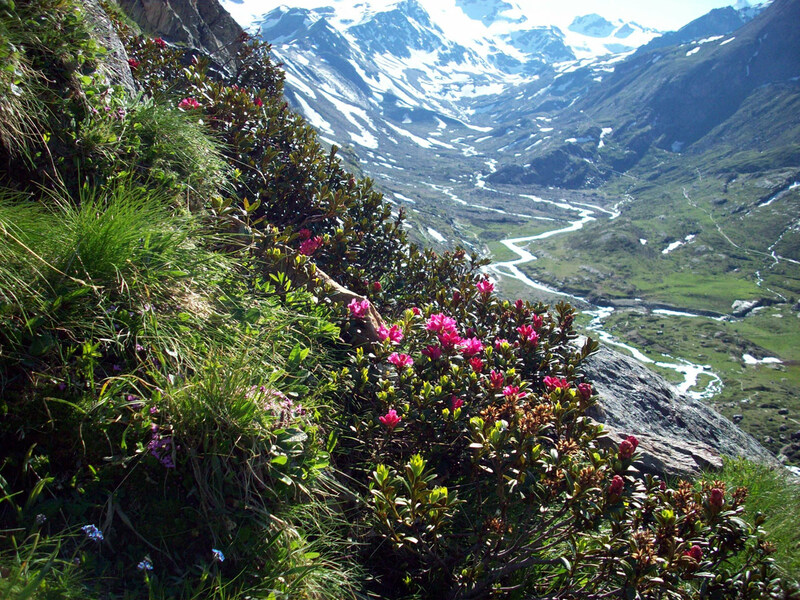 Passo di Gavia (Gavia Pass) is a high mountain pass in the Italian Alps. It is the tenth highest paved road in the Alps. The pass lies in the Lombardy region and divides the province of Sondrio to the north and the province of Brescia to the south. 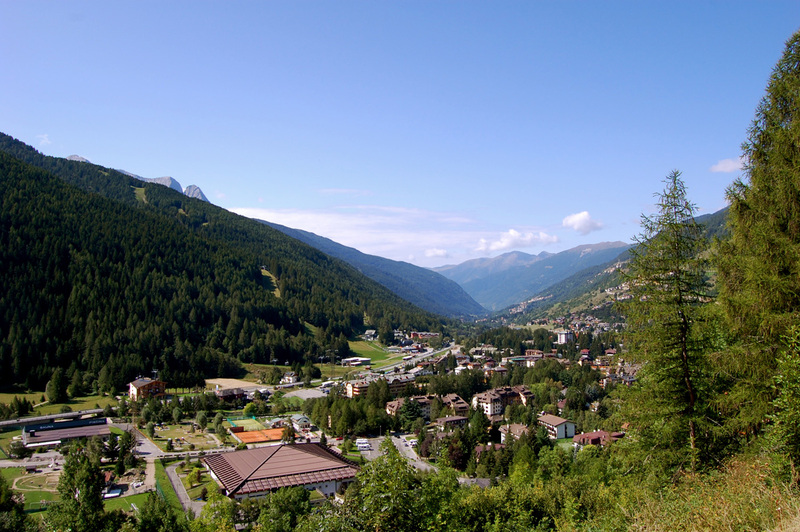 The road over the pass (SS 300) connects Bormio to the northwest with Ponte di Legno to the south and is single track most on its southern section. Passo di Gavia is often on the route of the Giro d’Italia road bicycle race and is sometimes designated the Cima Coppi, the highest point of the race. 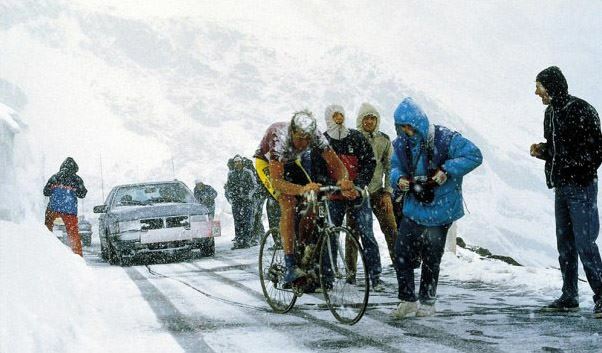 On 5 June 1988, the race passed over the Gavia in a snowstorm, making for an epic stage won by Erik Breukink. AmericanAndrew Hampsten, the second place finisher, became the overall race leader and went on to win the Giro. Andy Hampsten climbing Passo di Gavia, Giro d’Italia 1988. Passo dello Stelvio (The Stelvio Pass) located in Italy, at 2757 m (9045 feet) is the highest paved mountain pass in the Eastern Alps, and the second highest in the Alps, slightly below the Col de l’Iseran (2770 m, 9088 feet). Val Martello (Martelltal in German) is a valley in the province of Bolzano, which starts in the village of Laces and extends for about 30 km. Andy Hampsten’s Passo di Gavia ride at the 1988 Giro d’Italia was sensational. In the legendary stage fourteen of the 1988 Giro d’Italia with its crossing of the Aprica, a 120-kilometer trip partway up the Tonale and then a left turn up the south face of the Gavia pass with a final steep, technical descent into Bormio. The day was wet and cold. 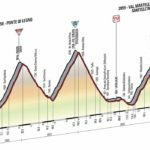 Until the start Torriani had been considering an alternate route because of the possibility of bad weather. It would end up being, in the words of La Gazzetta, “the day the big men cried.” Over the first two climbs, the cold, wet riders stayed together. 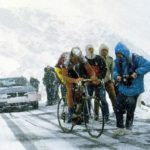 When they began ascending the Gavia with its patches of fifteen percent gradient (back then, only the Gavia’s switchback turns were paved), it began to snow and as the riders continued up the pass, it got ever colder. Johan Van der Velde, in just shorts and short sleeves, was first over the top. He was followed a few seconds later by Breukink, Hampsten and then by Chioccioli and Marco Giovannetti. Breukink and Hampsten had dropped the Italians well before the summit and crested together. 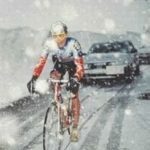 The conditions were appalling; the road was frozen and when the riders began the descent, their brakes wouldn’t work on the frozen rims. Some had their gears jammed up with ice. Van der Velde gave up, dismounted his bike, waited for warmer clothes to be brought from the team car and descended the steepest part of the pass on foot. He lost 47 minutes that day. Hampsten and Breukink pressed on down the steep, icy descent and into Bormio where Breukink won the sprint. Andy Hampsten became the first American, and non-European, to win the Giro d’Italia. 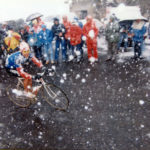 Andy Hampsten climbing Passo di Gavia, Giro d’Italia 1988. Andy Hampsten’s Passo di Gavia ride at the 1988 Giro d’Italia was sensational. 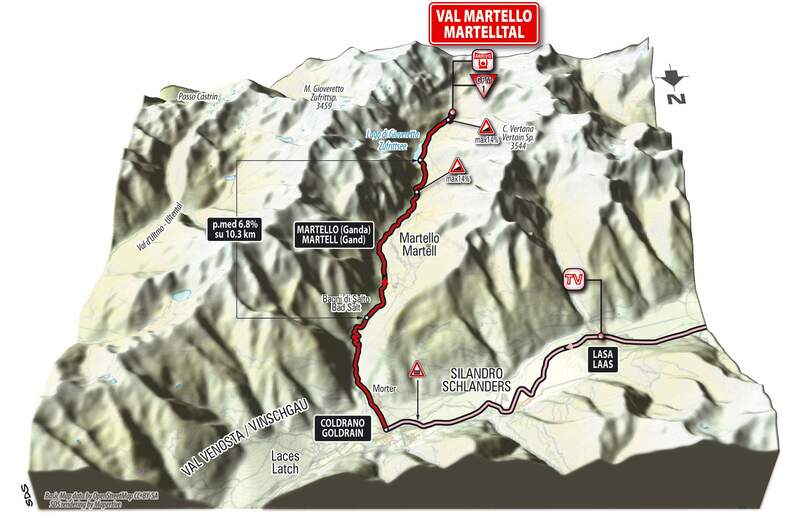 In the legendary stage fourteen of the 1988 Giro d’Italia with its crossing of the Aprica, a 120-kilometer trip partway up the Tonale and then a left turn up the south face of the Gavia pass with a final steep, technical descent into Bormio. The day was wet and cold. 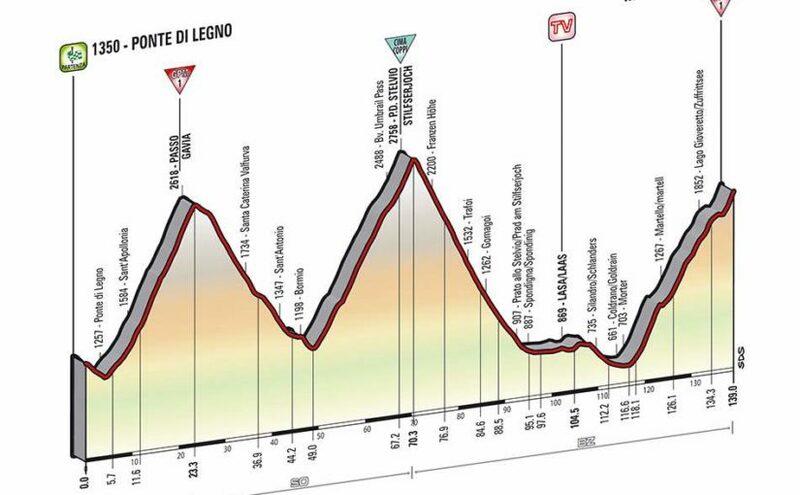 Until the start Torriani had been considering an alternate route because of the possibility of bad weather. 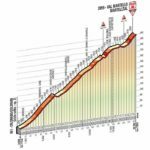 It would end up being, in the words of La Gazzetta, “the day the big men cried.” Over the first two climbs, the cold, wet riders stayed together. When they began ascending the Gavia with its patches of fifteen percent gradient (back then, only the Gavia’s switchback turns were paved), it began to snow and as the riders continued up the pass, it got ever colder. Johan Van der Velde, in just shorts and short sleeves, was first over the top. He was followed a few seconds later by Breukink, Hampsten and then by Chioccioli and Marco Giovannetti. Breukink and Hampsten had dropped the Italians well before the summit and crested together. The conditions were appalling; the road was frozen and when the riders began the descent, their brakes wouldn’t work on the frozen rims. Some had their gears jammed up with ice. Van der Velde gave up, dismounted his bike, waited for warmer clothes to be brought from the team car and descended the steepest part of the pass on foot. He lost 47 minutes that day. Hampsten and Breukink pressed on down the steep, icy descent and into Bormio where Breukink won the sprint. Andy Hampsten became the first American, and non-European, to win the Giro d’Italia. Passo dello Stelvio, Giro d’Italia 2012. Ryder Hesjedal of Garmin-Sharp is leading the maglia rosa, Katusha’s Joaquim Rodriguez. Giro d’Italia 1975: Eddy Merckx got sick at the Tour de Romandie and at the last minute he and his entire team withdrew from the Giro. This edition ended at the top of the Passo Stelvio. 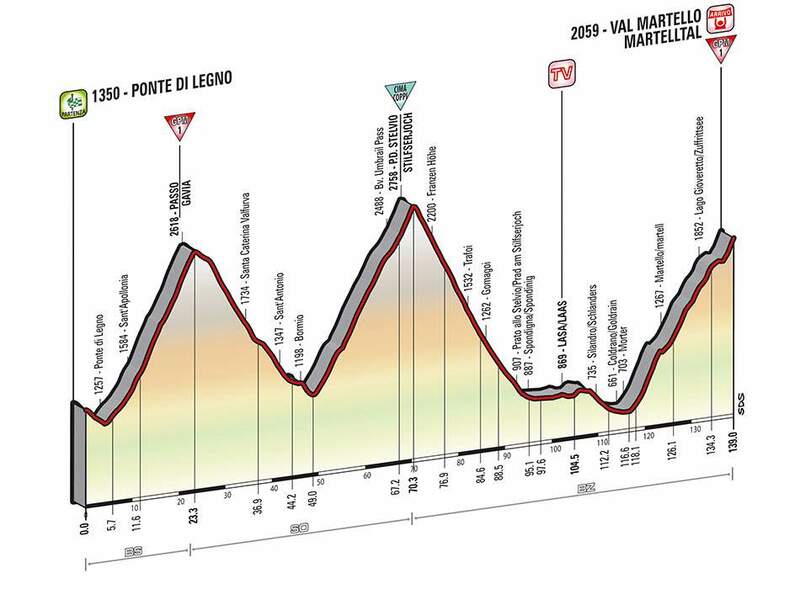 The last stage also went overthe San Pellegrino and the Costalunga passes. At the start of the last stage, Francisco Galdós (KAS) was only 41 seconds behind the GC leader Fausto Bertoglio (Jolly Ceramica). Before Stelvio, there were no action ton either the San Pellegrino or the Passo di Costalunga, everyone was waiting for the grand finale. While climbing the Stelvio, Galdós attacked many times, but every time Bertoglio was able to match him. He needed only to stay on Galdós’ wheel. Near the summit, Bertoglio attacked once, this time Galdós chased him down and catch him. The duo crossed the line together – Galdós was the stage and Cima Coppi prize winner, Bertoglio was the overall winner. The table of Cima Coppi history in Giro d’Italia and cyclist who passed the point first (Elevation in meters). Graziano Battistini, Passo dello Stelvio, Giro d’Italia 1965 (photo: gazzetta.it) Passo dello Stelvio was first included in the Giro d’Italia route in 1953 and Fausto Coppi was the first rider atop it. The first Cima Coppi prize, at the 20th stage of the 1965 Giro, won by the Italian rider Graziano Battistini of Vittadello team. The stage finish was planned to be atop Stelvio, but due to an avalanche, the road has been blocked and the riders had to dismount and run with their bikes to the finish line. The winner of 1965 Giro was the Italian rider Vittorio Adorni of Salvarani team. Before the Stelvio stage, Adorni was 11 minutes 26 seconds ahead of second-place Italo Zilioli, so he raced defensively. At an elevation of 2,757 m (9,045 ft) above sea level, Passo dello Stelvio (English: the Stelvio Pass) is the highest paved mountain pass in the Eastern Alps, and the second highest in the Alps, just 13 m (43 ft) below France’s Col de l’Iseran (2,770 m /9,088 ft). The Stelvio first featured in the Giro d’Italia in 1953, and Fausto Coppi was the first atop it (Coppi also won the stage and the 1953 Giro). It is also the highest point of Cima Coppi, the summit with highest altitude reached by cyclists during the Giro d’Italia, which was established in 1965, five years after the death of the “Il Campionissimo” (champion of champions) Fausto Coppi. The Cima Coppi is the summit with highest altitude reached by cyclists during the Giro d’Italia. It was established in 1965, five years after the death of the “Il Campionissimo” (champion of champions) Fausto Coppi.